There are many wonderful restaurants in Venice and Venice has a wonderful food culture that is often missunderstood by visitors who mistakenly eat in restaurants not dedicated to Venetian food. You can certainly get an excellent meal in any of the five start restaurants in Venice, but you can also get a wonderful Venetian meal – for the same price or less than in a tourist restaurant – in many of the small osterias, trattorias and restaurants in Venice. The restaurants listed here a normal-priced restaurants in Venice that focus on Venetian food, such as risottos and seafood dishes, and are frequented by locals as well a visitors. 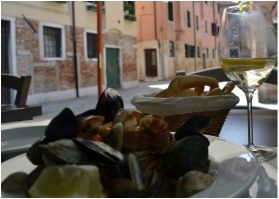 Read more about the tricky art of eating well in Venice on our blog, and eat in these restaurants and others like them to get an authentic taste of Venice during your stay. An exceptional Venetian restaurant experience all around! 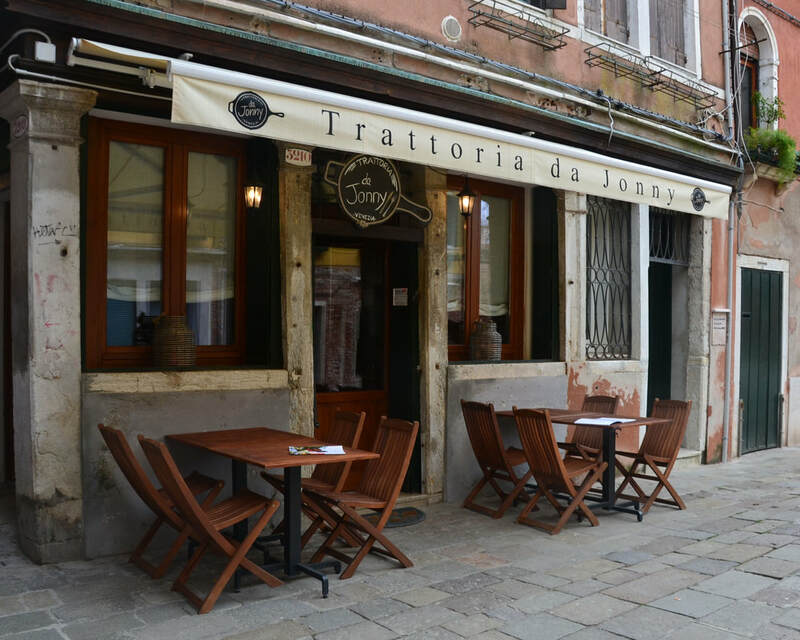 Trattoria da Jonny is located in a quiet square in the heart of Castello - there is no more "Venetian" neighborhood in all of Venice than this - is clean and contemporary by decor and employs a cheerful and friendly multi-lingual staff. But, more and most importantly, Da Jonny offers a select and updated menu of Venetian and Veneto area dishes all delicious and carefully prepared. And, though Jonny has certainly set a high culinary standard for his restaurant, his is also one of the only restaurants in Venice to offer a dedicated children's menu; A gesture which also makes it very inviting for families. My own family opted to eat here every day for a week and have been hounding me to get them Jonny's recipes ever since! Trattoria Storica, 4858 Cannaregio, At Ponte dei Gesuiti. No frills here! 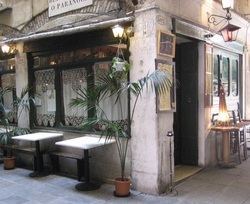 But potentially the best traditional Venetian food available, provided at prices that are nearly impossible to beat. Trattoria Storica is a favorite of locals in the Cannaregio district and a gem for those tourists who are lucky enough to discover it. This is where you should go to experience the real potential of "typical" Venetian food - baccala, sweet and sour sardines, grilled squid, fresh fish, spaghetti with clams, risotto with squid. You won't be disappointed with anything on the menu. But, whatever you do, don't leave without trying the antipasto misto! Osteria Ai Botti, On La Giudecca, Just off the Palanca Vaporetto Platform. Both a destination and a wonderful restaurant! Ai Botti has been a favorite of mine for more than a decade, and neither the new crowd of Hilton Stucky guests nor its recent renovation has done anything to hurt the food! Take a three minute boat ride from Zatere to Palanca and have dinner here, then walk the length of Giudecca and enjoy the perfect views of the Canale di San Marco. Osteria alla Frasca, 5176 Cannaregio, in Campielo della Carita, Near Fondamenta Nove. Consider not the humble appearance of Osteria alla Frasca on the approach, but rather the experience of enjoying an excellent meal overlooking the tiny Campielo della Carita. It's only minutes walk from Fondamenta Nove yet a world away from the hoards of tourists in other parts of town. Here you will be served fresh, simple, Venetian fare at reasonable prices in a peaceful neighborhood setting. Even by Venice standards, La Frasca can be uniquely tricky to locate. Keep your eyes peeled for the sign. La Porta D'Acqua, 1022/B San Polo, Near Campo San Silvestro. 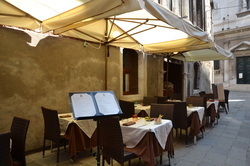 In spite of being decidedly on the tourist trail, with an enviable location between Campo San Silvestro and Rialto, La Porta D'Acqua is a wonderful restaurant. Not only is the food delicious and the service friendly, but the space...well, this clean, beautiful and warm spot is probably what visitors dream about when imagining a restaurant in Italy. It's perfect in every detail, from the glass chandeliers to the exposed brick to the preserved original paintings on the interior walls. Learn more on their ﻿websit﻿e or find them on Facebook. Osteria Antica Adelaide, 3728 Cannaregio, Calle Priuli Racchetta. A hidden gem in Cannaregio well worth seeking out for anyone interested in a wonderful seafood dinner. Adelaide is a surprisingly large and bright Osteria boasting large dining areas, a fully exposed kitchen, and an immense bar/ foyer area featuring stunning stained glass windows. This is definitely the kind of place one hopes to stumble upon in the backstreets of Venice and one of the great rewards for those who take a chance. The food is fresh and bright and served with a smile at reasonable prices. 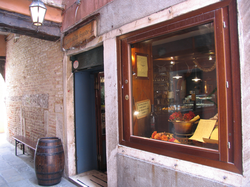 Adelaide can be tricky to locate so here's exactly how to get there: Osteria Antica Adelaide is located on Calle Priuli Raccheta in Cannaregio, just a few minutes walk from Campo Santi Apostoli. Leave the Campo by way of Strada Nova, the longest and widest street leaving the square. You will pass many shops and restaurants. Turn right into a small square where you will see a bar in the right corner (Corte dei Pali Gia Testor), and take the small street leaving from the far left corner of the square (Calle San Felice). Take the first right onto Calle Larga Priuli. Cross the bridge and you will be on Calle Priuli Racchetta. Osteria Antica Adelaide will be on your left. Taverna Del Campiello Remer, Campiello Remer, Cannaregio, Near Rialto. Taverna Del Campiello Remer Campiello Remer, Cannaregio, Near Rialto. Remer is a beautiful local on the Grand Canal directly opposite the Mercato, now with the same excellent food and wine selection and a refreshed upbeat atmosphere. Remer is fairly famous in Venice, not only for it's excellent food and idyllic location, but also for it's wonderfully historic interior where details from several centuries, wells, pillars and statues have been painstakingly preserved. Remer frequently hosts live music and has a happy hour featuring excellent wines and cicchetti. You learn more on their website. Al Remer is another place that can be tricky to find. Here's how to get there: Though tricky to find, it is really only a short walk from either Campo Santi Apostoli or Campo San Bortolomeo. From Santi Apostoli: Leave the campo by way of the bridge. You will cross one more bridge, then take the first small street on your right. The street is just to the left of a Tobacco shop. Follow two twists in the street and you will arrive in Campielo Remer. From San Bortolomeo: Leave the Campo by following the signs for Ferrovia. Cross one bridge, then take the final small street on your left just before the second bridge. The street will be found just to the left of a Tobacco shop. Follow two twists in the street and you will arrive in Campielo Remer. Bacarando ai Corazzieri, Castello, Salizada Pignater, Near Bragora. Good food and all that jazz. A favorite among Venetian of all walks of life and it's easy to see why! Ai Corazzieri dishes out beautiful and reasonably priced seafood meals prepared in local style, has an upbeat ambiance complimented by friendly service, and live jazz, sole and acoustic music several nights a week. For people seeking a down-to-earth and genuinely local experience in Venice this place can not be beat. Check out their Facebook page for the daily menu and upcoming events. Cantina Do Spade, 859/860 San Polo, On Calle Do Spade, Near The Rialto Mercato. Offering up Venetian classics like whole fried or grilled polipo, grilled calamari or squid salad, Cantina Do Spade is a small traditional Venetian osteria that takes full advantage of it's proximity to the Rialto Mercato. They've got some of the very best fried seafood cicchetti in Venice and offer a small selection of excellent full meals as well. Do spade has a small bar area, some outdoor benches and a small but neat dining room with large wooden tables and benches. This is an essential destination for those who want a down-to-earth Venetian meal. Eno-Osteria Al Timon, 2754 Cannaregio, On Fondamenta Ormensini. 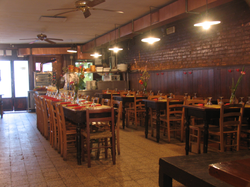 The Eno-Osteria Al Timon is a local favorite with a serious commitment to regional cuisine. They had a good wine selection, good crostini and serve wonderful and reasonably priced “traditional” venetian meals ranging from fried fish through pastas, meats and stews. If you're feeling adventurous, try the tripe! Al Timon has a fairly large indoor seating area as well as several tables outside along the Rio della Misercordia. 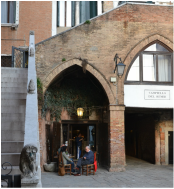 It is an ideal off-the-beaten-trail place to have an excellent relaxed meal and take in some of the “real” Venice. Sacro e Profano, 502 San Polo, Very Close to the Rialto Bridge. The Osteria Al Sacro e Profano is one of those places that one walks into and immediately feels at home. The décor is casual and warm, featuring a smattering of musical instruments as a nod to the owner's prior career as the trumpet player for the Italian reggae band, Pitura Freska. (See a video of Pitura Freska performing in Venice HERE.) Sacro e Profano offers full meals of Venetian fare in a small seating area, and a selection of wines and cicchetti at the bar, which you can also enjoy on benches outdoors. How to get there: From the Rialto Bridge, Facing the Mercato side of the Rialto bridge, descend the bridge on the left-hand side and stay to the left. Walk under the Sottoportego di Rialto to the left hand side of all the shops and vendors that extend from the foot of the bridge. Turn left on the second street to the left, Ramo Secondo Del Paragon. You will find Sacro e Profano ahead of you to your left. Paradiso Perduto, 2540 Cannaregio, On the Fondamenta Della Misercordia. Rumor has it that when the original owner opened this restaurant and called it "paradise lost", he was trying to recreate the lost atmosphere of a traditional Venetian osteria. The Osteria Paradiso Perduto is now under new ownership and everything is looking great from the freshly cut flowers adorning each table through the cicchetti and the Sunday afternoon seafood buffet. It's recent facelift has only enhanced the away-from-it all atmosphere of the place and it's fantastic relaxing location along the Canale delle Misercordia. Paradiso perduto often hosts events, including live music from a boat in the canal. You can find out about what's going on during your stay on their blog.